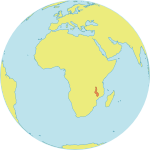 MANGOCHI DISTRICT, Malawi – A phone call changed Nachilango Bisolomo’s life. For 46 years, she had suffered from an obstetric fistula, a stigmatizing injury caused by childbirth complications. Fistula causes incontinence and can also lead to infections, chronic pain and other problems. “Everywhere I sat, I left a mark, and people would come to see, and talk so much about my condition. I was helpless and could not do anything about this,” she told UNFPA. Like many fistula survivors, she felt embarrassed and alienated. “My life has been hell,” she said. 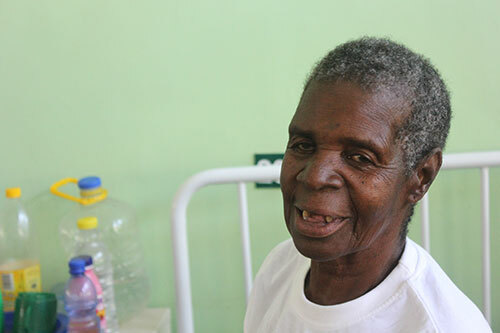 But then one day, Ms. Bisolomo’s son-in-law was at the Monkey-bay Community Hospital in Mangochi District, and he saw a ward full of women wrapped in 'chitenje', a fabric worn around the waist. The women explained that they were fistula survivors. The hospital was holding an obstetric fistula "camp," and repairing fistulas free of charge. He immediately phoned his mother-in-law. 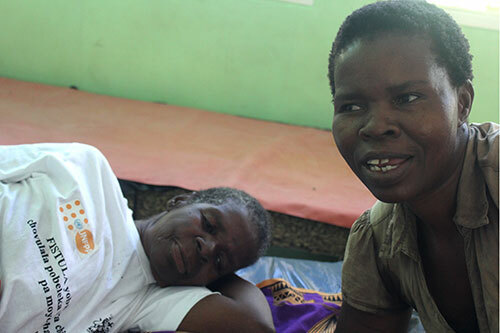 Ms. Bisolomo quickly travelled the 300 km from Dedza District, and the next day, she underwent the surgery. When she was wheeled out of the operating room, her niece, Anastanzia Paulo, cried tears of joy. Ms. Bisolomo's long ordeal was coming to an end. Ms. Bisolomo was born Nasiwelo Bisolomo. She married early, and was pregnant by 18. She had no idea that adolescent pregnancy increases one’s risks. Childbearing before the pelvis is fully developed can lead to prolonged and obstructed labour, the complication that causes an obstetric fistula. At the time, Ms. Bisolomo lived over 100 km from the nearest hospital, so she gave birth at home. The labour was horrendous and long, and, tragically, her baby died in the process. Afterward, she was left with a fistula. The loss was devastating – as was life with her condition. “I accepted that I will be like this for the rest of my life,” she said. Still, in some ways, Ms. Bisolomo was fortunate. Many women with fistula are abandoned by their families and persecuted by their community. But Ms. Bisolomo’s family life was just beginning. She and her husband managed to successfully have another baby, Natumani, who is now 45 years old. Her husband stayed with her until he died in 2012. Then Ms. Bisolomo learned about the fistula camp, an initiative supported by UNFPA and organized by Mangochi District Hospital. Forty-one women received care at the camp. Some were referred elsewhere for more specialized operations; over half were repaired and discharged. Surviors like Ms. Bisolomo are now helping to spread the word that fistula treatment is available. “We are able to mobilize more patients through the treated patients, who act as our ambassadors,” said Lydia Kasiya, a nurse and midwife technician. Ms. Bisolomo plans to keep her name to send a message to other women. Since 2011, UNFPA, the Freedom From Fistula Foundation and AMREF Health Africa have supported the government in providing fistula treatment in Lilongwe and Mangochi. Last year, fistula camps were held in Chikwawa, Mulanje and Mangochi districts, including at the Bwaila fistula centre. But fistula repair services are not enough. The condition is easily prevented through access to emergency obstetric care – usually in the form of a Caesarean section. In fact, the condition is so preventable that it has been essentially eliminated in industrialized countries. UNFPA supports midwifery trainings, health centres and reproductive health supplies to bolster the availability of emergency obstetric care in remote areas around the world. Meanwhile, Ms. Bisolomo’s family is determined to convince more women to seek proper health care.